Invest in ME Research is an independent UK charity campaigning for biomedical research into ME. It has links nationwide and also internationally. 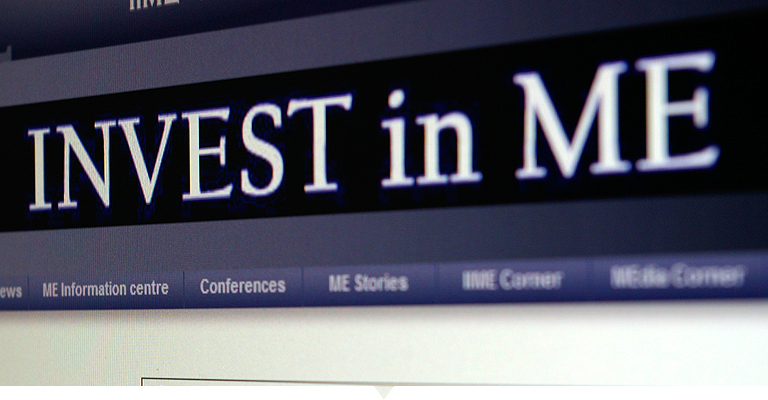 Invest in ME Research is one of the founding members and current chair of the European ME Alliance. Invest in ME Research aims to bring together international researchers and facilitate an understanding of the aetiology, pathogenesis and epidemiology of ME. This should lead to the development of biomarkers for the diagnosis of ME, and subsequently, medical treatments to cure or alleviate the effects of the illness. Invest in ME Research wishes to establish an international strategy of biomedical research into ME and has already laid the foundations of its own UK centre of excellence for ME research. The charity is already funding a number of PhD and medical students to help drive the future of biomedical research into ME and treatment. Invest in ME Research bring together researchers, clinicians, patients and patient groups at annual international conferences and colloquiums and are organising and funding leading research projects including the role of gut microbiota in ME.